Eve was a very sad six-year-old last weekend. The strap broke on her absolutely favorite sandals in the whole world. They were white and covered in tiny rhinestones. It was sparkly awesomeness as only a six-year-old can adore. We looked for replacement sandals, but none of the white sandals were sparkly at any of the stores we went to. It was a sad, sad day. We found a pair of cute white ones with flowers, and Eve in her brilliance said, “Mom, can’t you put some Dazzling Diamonds on these to make them sparkly?” And I thought, why yes, yes I can! Stampin’ Up to the rescue again! I put Crystal Effects in the center of each flower, and also around the outside of the biggest flower (also Eve’s idea), and liberally poured on the Dazzling Diamonds glitter. Wow! It worked beautifully! Thank goodness I had my Stampin’ Up supplies! You just never know when they are going to come in handy! I had another Big Shot moment the other day. My most favorite, most comfortable, most worn pair of jeans got a hole in the knee. And it is just too cold to be walking around with a hole in the knee! So once again it was Iron-on patches and the Big Shot to the rescue! 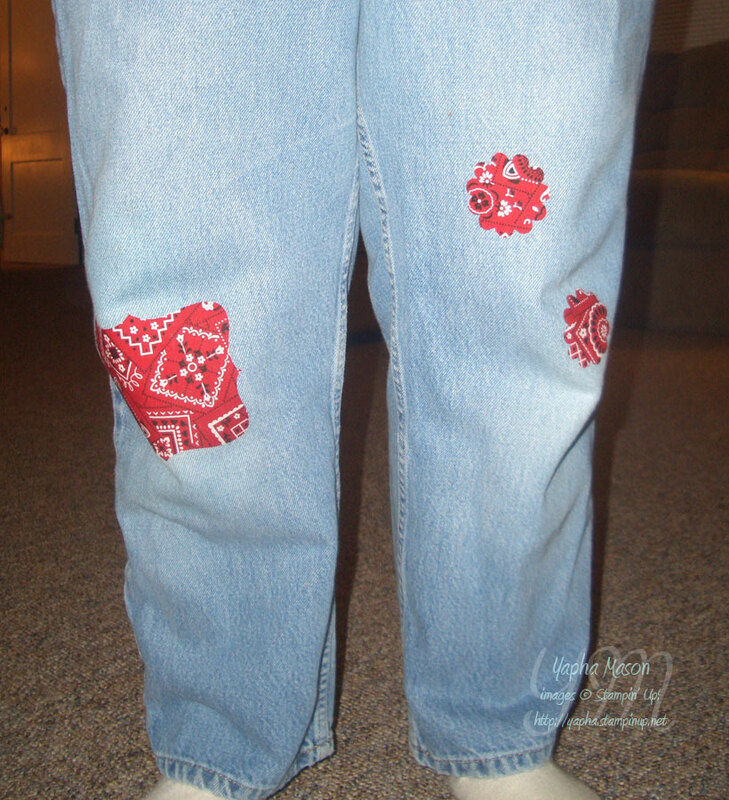 (Remember the first pair of jeans I patched like this?) I didn’t want to use the same bandana fabric again, so this time I just used a darker jean material. 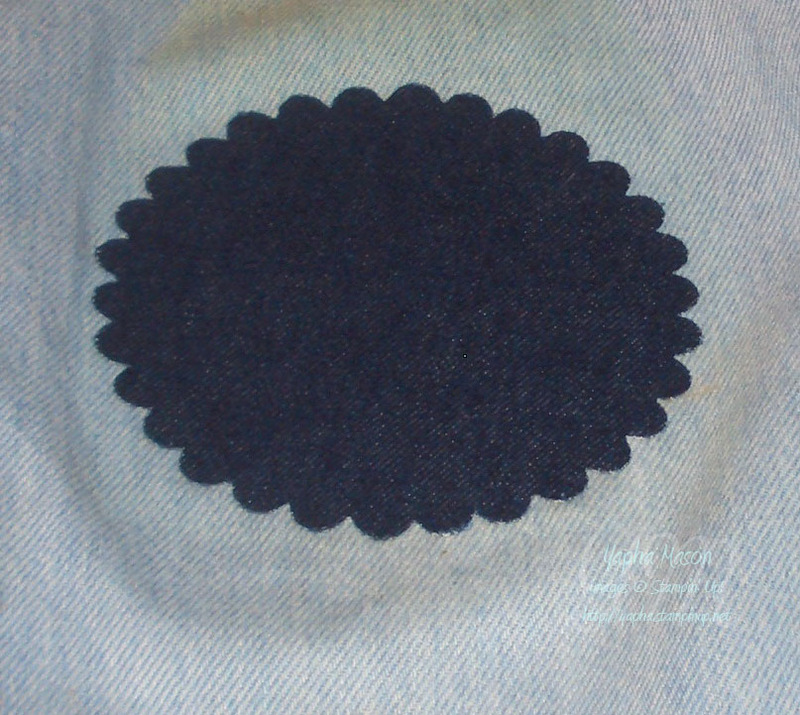 I die cut the patch into a large scalloped circle, and ironed it on. I love my Big Shot! The only thing that would be cuter would be to layer another scalloped circle on top of this one, in a different pattern, of course! I think I might need to go find some more iron-on patches in different fabrics! One of the great things about the new school where I am the librarian is being able to wear jeans on Friday. 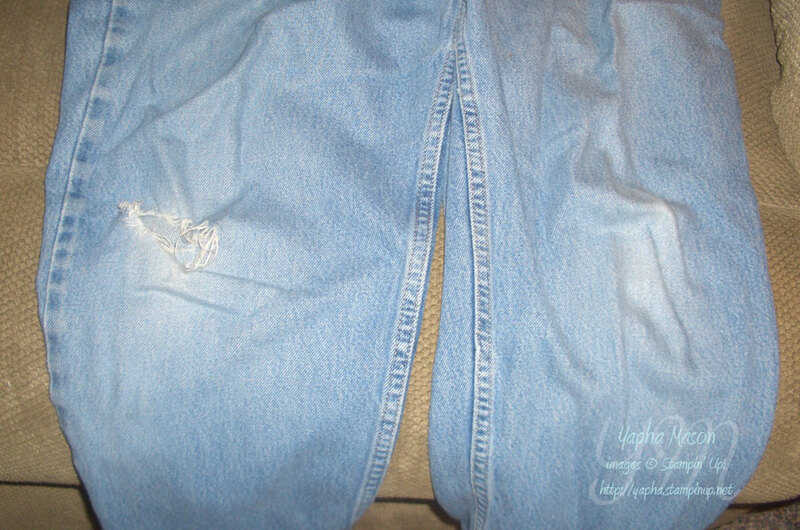 But even so, I didn’t want to wear my favorite pair of jeans with the big hole in the knee. I didn’t think it looked professional. 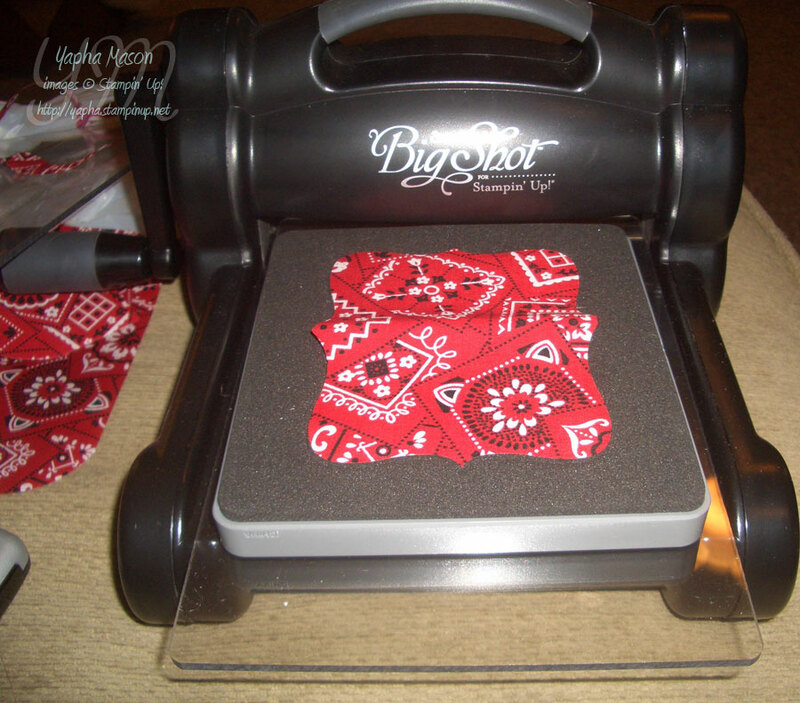 So I went in search of something to patch it with, and I found a bandanna print iron-on patch. I though it would look pretty good. And then I remembered that the Big Shot cuts fabric! Wouldn’t it be cute, I thought, to make the patch into the shape of the Top Note die? So I did! This is how the jeans started out. Then I ran the iron-on patch through my Big Shot. I had some material left over, so I also ran it through using the Scallop Die #2, and made two small scalloped circles to decorate the other leg. The patch ironed on quickly and easily. 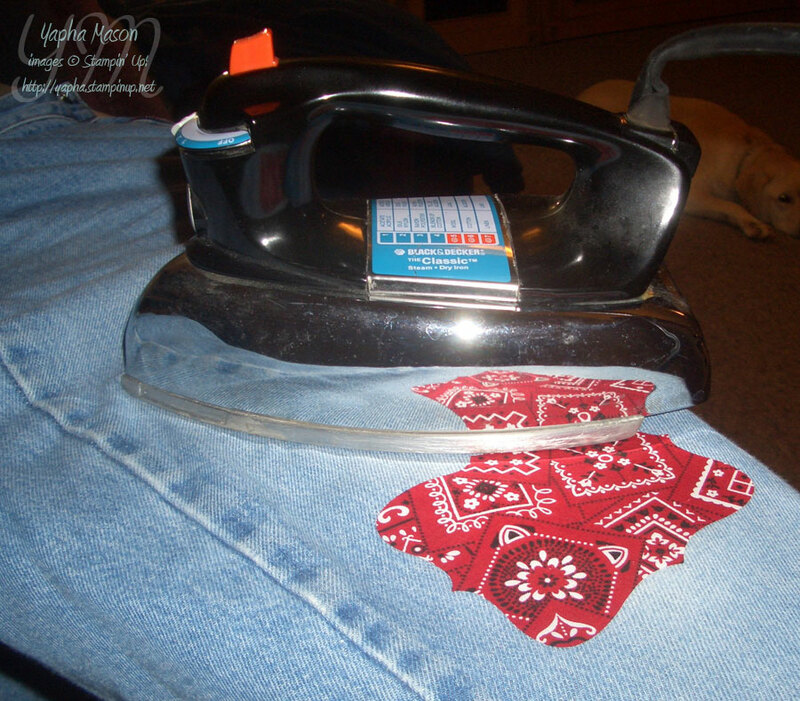 I’m a big fan of iron patches! I love them! I can’t wait to try my Big Shot on even more types of materials!